MARK: What encouraged your parents to come? JESSICA: To Australia? Well, my father had been out to Australia when he was a very young man with an acrobatic troupe. MARK: What was their name? JESSICA: I can’t remember. He told me. I used to know but I just can’t remember. I’ve tried to remember. JESSICA: No, they came out I think for Wirth’s. That’s the only show we were ever with in Australia. MARK: But when your father came out earlier? MARK: He came out earlier for Wirth’s Circus? JESSICA: I can’t remember what the name was. Anyway, he always said that when he went back to Europe, when he got married and had a family, [that] he would come back to Australia. So he did. He came out to Wirth’s. [In] 1923 we came out to Australia. We left [Australia towards] the end of 1929. So thanks to internet, I've been able to validate Jessica Georgina's memories of what her father told her! Below are various references found for Jessie and Carmelo, taken from passenger lists and newspaper clippings. Sailed from Havana (Cuba) to New York, with the Egochagas. Shown as in transit for 10 days with Australia as final destination, on S.S. Makura due to sail from Vancouver on August 31. 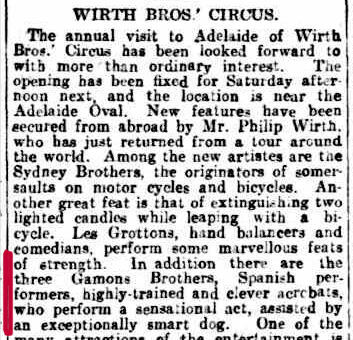 Among the new clowns are the Alfredo Egochago troupe from South America, who stage burlesque Spanish bullfight in which small dogs fitted with horns take the place of bulls. A musical "turn" by Egochago and Carmella is entertaining, and Williams and Palomar also provide amusing interludes. / The Carmella Trio, another of the new "acts," are sensational jugglers of a high order. Jessie with a tiny fox terrier, The Carmella Trio of jugglers, Danny Palomar and Melo with their performing dogs. The four Palomars wonderful acrobats Risley* act. * Wikipedia definiton: Risley is any circus acrobalance posture where the base is lying down on their back, supporting one or more flyers with their hands, feet and/or other parts of the body. In her letter to her cousin in 1946, Jessie mentions this, and the fact that it was a rare act for women. Amongst the acrobats, the Palomar family established a standard by which we could judge the similar turns following.